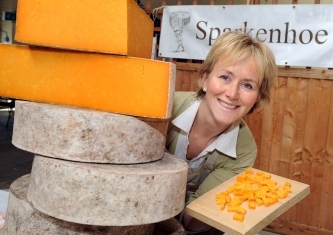 Cheese-makers from all four corners of the British Isles will gather together at the third annual Artisan Cheese Fair to be held in Britain's rural capital of food Melton Mowbray, on 4th and 5th May 2013. Serving up over 150 varieties of Great British cheeses - from the well-loved and ubiquitous English Cheddar to the more specialist regional cheeses including Hampshire's Organic Turnstone, Cornish Yarg and Swaledale - this year promises to be the biggest and best ever. "As Great Britain is fast becoming a rival for France, in the amount of native cheese varieties the country now produces, the aim of The Artisan Cheese Fair is very much about supporting the specialist business of making good quality cheeses and enhancing the UK's growing reputation," says organiser Matthew O'Callaghan. "This year the festival has grown four-fold and we are expecting a large number of cheese-lovers to come and visit us in Melton Mowbray - the home of one of Britain's best-loved of British cheeses - Blue Stilton," he adds. "For those interested in how you make cheese, we will also be demonstrating production of one of this region's oldest cheeses, Colwick Cream Cheese, originally made in Nottingham in 1645. Sadly production ceased in 1995 but we will be bringing it back to life at the festival," says Matthew. For more information, 'Like' the Artisan Cheese Fair's page on Facebook.